Who Are France's Yellow Vest Protesters, And What Do They Want? Nicknamed for the safety vests worn by protesters, the yellow vest movement has sparked a political crisis for the French government. In Paris, demonstrations turned into riots over the weekend. Demonstrators gather near the Arc de Triomphe in Paris during a protest on Saturday. Nicknamed for the safety vests worn by protesters, known as gilets jaunes, the yellow vest movement has sparked a political crisis for the French government. 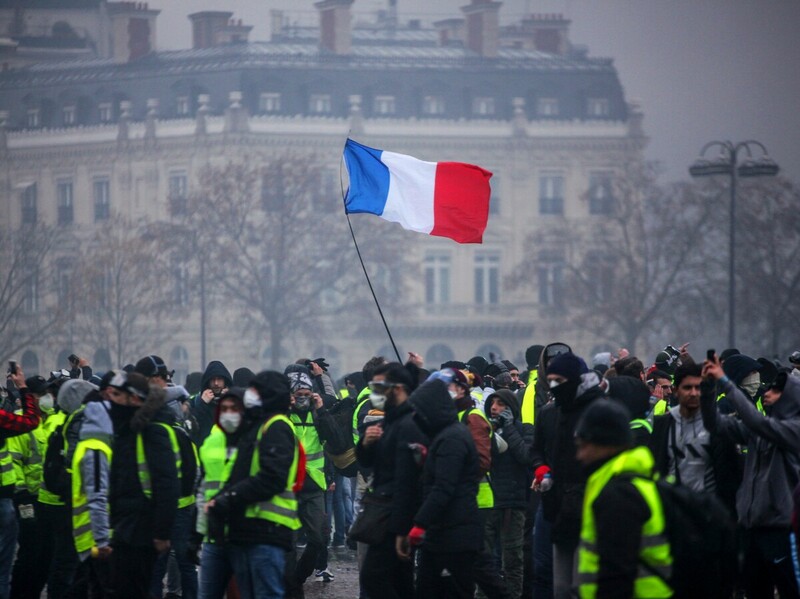 The protests started in the French provinces but spread to Paris, where demonstrations turned into riots over the weekend and scenes of violent civil unrest played out along the city's famous Avenue des Champs Élysées. Originally, the yellow vest protesters were people from rural areas who have to drive long distances as part of their daily life. They said they couldn't afford the hike in fuel prices. Protests appeared in pockets around France to denounce Macron's green tax and then quickly grew into a larger movement that includes members of the working and middle classes who are expressing their frustration about slipping standards of living. They say their incomes are too high to qualify for social welfare benefits but too low to make ends meet. The movement has no official leadership and was organized initially through social media groups. The protesters focus on Macron as the source of their problems. 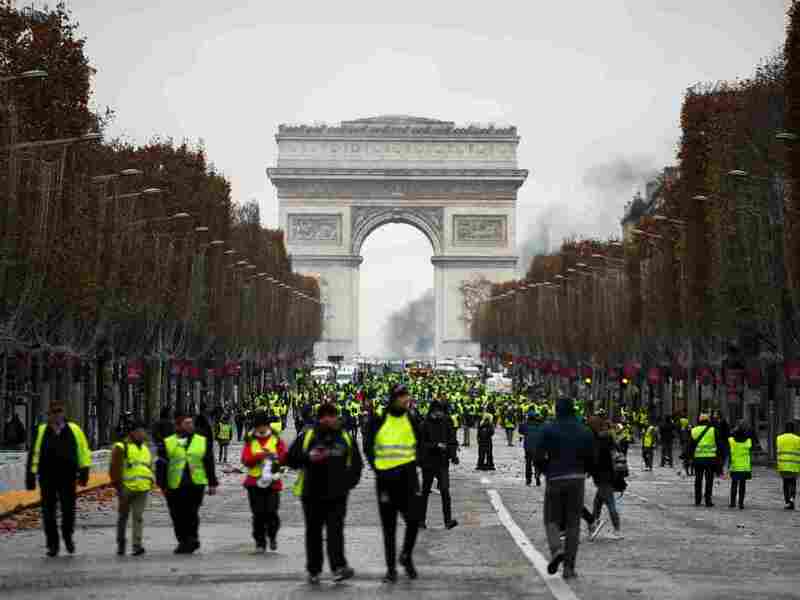 Along with his early reforms to loosen labor laws and slash France's famous wealth tax, the fuel tax reinforces protesters' image of him as a president of the rich. Most yellow vests at blockades around France are peaceful protesters. Violent protests erupted over the weekend in Paris, where rioters defaced the Arc de Triomphe and the Tomb of the Unknown Soldier, looted shops, vandalized buildings and even attacked police. French authorities note that most of the violence and vandalism were incited by anarchists known as "casseurs" — rioters, thugs from the ultraleft and ultraright. Paris police held 380 people in custody after Saturday's riots. The city estimates total damages at $3.4 million. Their initial demand was to repeal the green tax on diesel. Now, others want the current minimum wage (about $1,350 per month after taxes) to be raised. There have also been calls to dissolve the National Assembly and hold new elections. There have even been chants of "Macron resign!" The "yellow vest" protests began last month. Large demonstrations turned violent in Paris over the weekend. According to a poll conducted Sunday by Harris Interactive for French media, 72 percent of French people support the yellow vests, even after Saturday's riots. But 85 percent responded they are against the violence. Four people have now died since the protests began three weeks ago. Three were killed in separate traffic accidents caused by roadblocks set up by yellow vests, and an 80-year-old woman in Marseille died from injuries she received when a tear gas grenade hit her in the face as she closed her apartment windows to protests below. Prime Minister Edouard Philippe met today with leaders of political parties holding seats in France's Parliament to discuss possible solutions to the crisis. Philippe was scheduled to meet with a delegation of yellow vests on Tuesday, but the representatives canceled, citing personal security concerns after receiving anonymous death threats. The government had already invited yellow vest protesters to talks last week, before Saturday's riots, but the delegation abandoned the meeting when they learned the discussions wouldn't be filmed or broadcast. Depending on what measures the government announces this week, the French government's top priority is preventing more riots and making sure proper security is in place in the event of more protests. Macron has previously said he won't back down on the fuel tax. Since he took office 18 months ago, the French president has seen public pushback on almost every one of his reforms, especially liberalizing the labor market. However, this is the biggest political crisis he has faced so far, and it could determine the rest of his presidency.